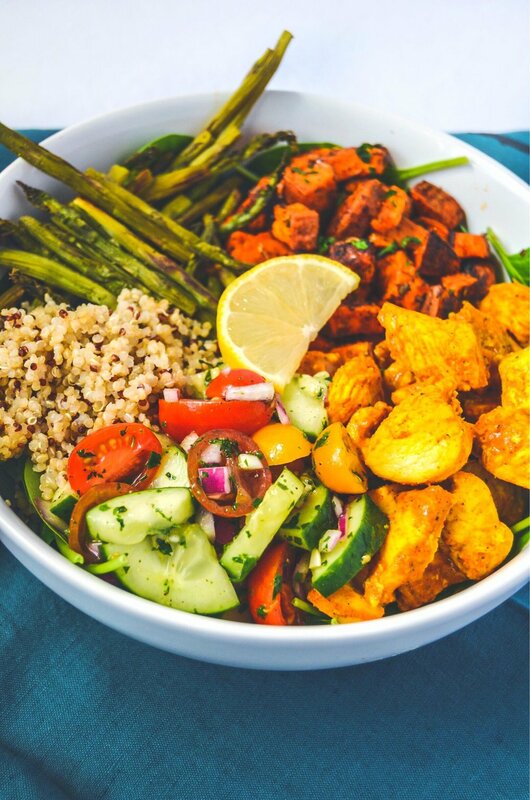 Chicken Shawarma Bowls - Bursting with flavor, fresh and full of color!The fascination for chicken shawarma started fairly recently. I put sole blame on this cute Mediterranean restaurant, Cafe Arazu, located a little too close to my work, lol. This type of chicken shawarma is very different than what I’m typically used to but is still amazing in its own way. The classic way of cooking shawarma is to mount large marinated chicken chunks onto a large rotating skewer. The chicken then slowly roasts against a gas burning grill. The restaurant that I typically go to for lunch does it differently by marinating the chicken in a wonderful blend of cumin and turmeric. They finish it off by grilling the chicken. If you haven’t figured it out yet, grilling is the exact route I’m going as well! While it would be nice to have a rotating meat skewer with a gas burning grill at my house, it’s not ideal or practical! Now you can prepare just the chicken shawarma and add them to wraps or just as appetizers with a nice aioli sauce, but what I have found to be my favorite is to put everything in a bowl. Bowls are an easy way to load up on veggies while adding a grain and protein to keep you full and nourished. The ingredients that I added to my bowl can be interchanged depending on your preference so have fun with it! I paired a quick and easy tomato salad to go along with the chicken. You can find the ingredients for the salad below. I also added some roasted sweet potatoes which I seasoned with smoked paprika, garlic, and oregano. Being an advocate of meal prepping, this recipe has been in my lunch meal prep for three weeks straight! (Okay, mainly for recipe testing but hey, I cannot complain!) And I could go on and on about this recipe but the biggest thing I love about it are the flavors! Every part is bursting with flavor that you can’t help but want more! Bursting with flavor, fresh and full of color! Gluten free, dairy free and meal prep option! Season chicken with salt and pepper on both sides and add to a Ziploc bag. Combine the seasonings, oil, and lemon juice to chicken and marinate in the fridge for at least 2 hours or overnight preferably. While your chicken is marinating, prepare the sides by starting with quinoa first. Cook quinoa in a rice cooker or stove top as directed. Preheat oven to 425 degrees. To a small bowl, add diced sweet potatoes, seasonings and oil. Toss with tongs until sweet potatoes are fully covered in oil and seasonings. On a parchment lined large sheet pan, place sweet potatoes on a single layer. You should have room to add the asparagus but make sure that the veggies are not too crowded and on a single layer. Prepare the cherry tomato salad by dicing all veggies and adding to a small bowl. Add the vinegar, maple syrup, chopped parsley, and oil and toss until combined. Add salt and pepper and season to desired taste. I like this with more vinegar so I usually add another tbsp of ACV or a squeeze of a lemon wedge. After the chicken is cooked through, prepare your bowls or meal prep containers by adding the mixed greens first, then cooked quinoa. Add your veggies such sweet potatoes, asparagus, etc. Then, add your tomato salad, chicken, and top with a lemon wedge and parsley.